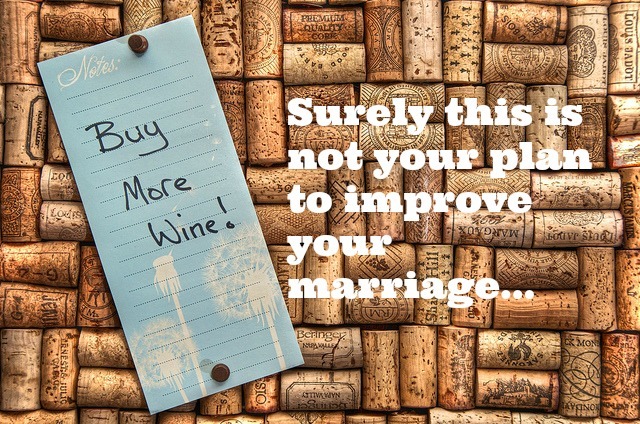 What is Your Plan to Improve Your Marriage? You may have the model marriage. You may have a marriage on the brink of divorce. You may be newlyweds, or seasoned marriage vets. No matter, you can always improve your marriage. But, it won’t just happen. You have to make it happen. So, what is your plan to make it happen? What is your plan to improve your marriage? Have you gone on vacation with your family? I bet you planned that vacation. Have you taken a road trip? You probably mapped it out, or put it in your GPS. Are you an entrepreneur? At some point you created a business plan, or at least were told you needed to. Trying to get out of debt? You are probably following the Dave Ramsey plan or some similar debt elimination plan. And I bet you had a plan for your wedding! Perhaps that could be the reason about half of marriages fail. There was no plan to have a lasting, loving, and amazing marriage. If you want a better marriage, you have to invest in it. You have to know that you want it to grow, to last, and to be fulfilling to both you and your spouse. Once you decide that, which should have been decided before saying “I do,” you then have to be intentional. Once you and your spouse are in agreement it is time to start designing a plan that will lead to your ideal marriage, and lead toward that “happy ever after” you hoped for on your wedding day. On June 16th, I will have been married to my wife for 12 years. I admit, we have never written a marriage success plan for our marriage. However, we agreed to begin writing our plan this weekend while away at a marriage retreat. In preparation, I’ve considered some things that should be included in our marriage success plan as well as yours. Marriage goals. What do you want to happen in your marriage? Where do you want to go? What do you want to accomplish together? Write it down. Studies show that writing your goals down increases your chances of achieving them. Mission, Vision, and Purpose. God brought you together for a purpose bigger than you. Begin to seek it out. How will other people be positively impacted by your union in a way that neither of you could have done individually. Find marriage mentors. The bible cautions us about making plans without seeking counsel, “plans fail for lack of counsel.” Your marriage needs regular counseling or mentoring, which will give you insight from the experiences of other great marriages. Regular date nights. This is like food for your marriage. Without a commitment to continued courting, activities, and time alone it will be hard to thrive. Our bodies need food. Our marriages need dates. Annual big vacations (alone). Seeing and experiencing different things together is like a breath of fresh air. Getting away from the norm, can clear your mind and provide an escape allowing you to focus on one another. Plus it is just fun! Small weekend getaways. Like the big vacations these are good for removing all distractions. They could be in the form of a marriage retreat, a shopping trip, or just quiet time together. A couple to mentor. Just like having kids, having another couple to teach and share your experiences will cause you to be more accountible, and seek to learn more in hopes of improving your marriage and their marriage. The Dead Sea is dead because water only flows in, and nothing flows out. Mentoring serves as your way to pour your blessings into another couple. Married friends in the same season. Sometimes in marriage you feel as if you are the only couple going through. You may feel your mentors and mentees don’t understand. Having married friends similar to your stage will prove this wrong and provide opportunities for you to relate to others along the same journey. Boundaries. You should agree to never do certain things, and to never cross certain lines. A boxing match has rules, MMA fighting has rules (I think). Even when you are disagreeing these boundaries need to be respected. Leaving a legacy. How will you pass on your family name. Kids? How will you impact the next generation of marriages? Ministry? Make a plan to be a blessing to future generation of marriages. Financial and fitness plans. Your bodies will not look the same as they did on your wedding day. Hopefully your finances will not either. Make a plan to be as healthy physically and fiscally as you can. Your spouse could be your exercise partner. Your financial plan will determine some of your ability to do some of the other aspects of your plan. Pour into your marriage. Never stop learning your spouse. Never stop trying to improve your marriage. Read books, attend seminars and retreats, subscribe to blogs, talk to couples you respect. Spend time and money on improving your marriage. Family is the foundation to many things in society. Your marriage is the foundation of your family. Pour a solid foundation with a great marriage success plan, then give all you have to make sure your plan succeeds. Questions: What is your plan to improve your marriage? Is there anything you’d add to the list above? Please share in the comment section below.